Brett Luke | The Journal Gazette Gary Graham will be back behind the Komets' bench for the 2018-19 season. The Komets are in for a rebuild, that's clear after ECHL MVP Shawn Szydlowski became the latest to sign to play overseas, but coach Gary Graham will definitely be on board to orchestrate the new-look Komets. While no official announcement has been made by the Komets, Graham confirmed that both he and assistant Ben Boudreau will be back next season. Olivier Legault, who was also assisting, will be back too. "Ben and I have been re-signed, so the staff is intact with me, Ben and Legs," Graham said. 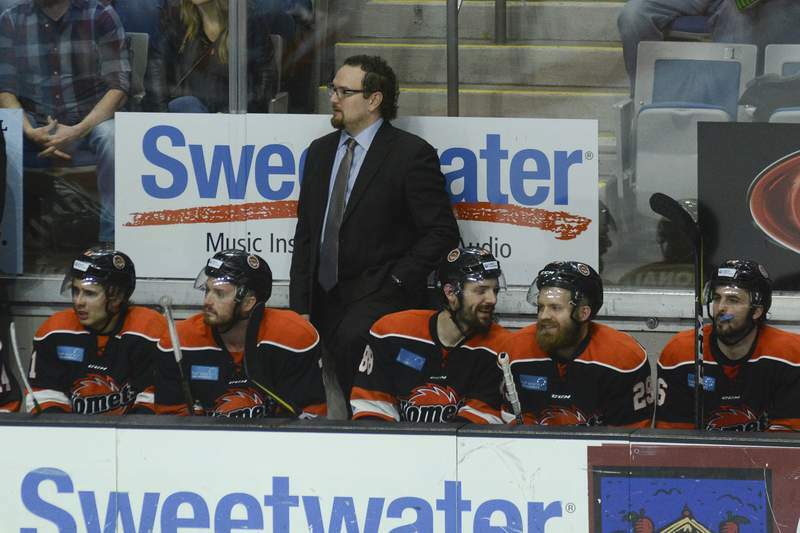 There really wasn't much doubt; general manager David Franke made it clear after the Komets were ousted from the playoffs he wanted the coaching staff back. "It’s going to be a different-looking team, for sure, but we’re excited to get some new guys in here and teach them the Komet way," Graham said. Szydlowski, who couldn't be reached for comment, has signed to play in Norway, meaning the Komets have lost the face of the franchise after he led the ECHL in scoring. "I think it’s important to note that we all should be happy for Shawn and everything he’s given to the organization over the last five years," Graham said. "This is a great opportunity for him in his career and where he is with his age. He’s not getting any younger. He’s got a few years to really optimize where he’s at contractually and set himself up for his future, so the timing was right." The Komets have also lost Gabriel Desjardins, Garrett Thompson and Mason Baptista to contracts in Europe. Curtis Leonard is signing in England. So the rebuild is on. "I’m not afraid to use the word. I think we’ll have some core guys back like we always do, but it would be hard not to say that’s not what’s happening," Graham said. "There are a lot of guys getting opportunities and you have to look at the silver lining. "We had the top-scoring team in the league, and a team that was one goal away from the finals, and a team that was full of guys who had career years. And it was an older team. We knew last summer, when we built this team, eventually there would be a time when these guys would all be either retiring or going a different direction."